The vast majority of consumers are constantly looking for ways to increase energy and focus, but finding healthy solutions isn’t easy. TeaZa has introduced the ‘Hip Way to Dip’ program, as part of their Operation Tobacco Free initiative to educate smokeless tobacco users and those seeking an energy boost about a healthy alternative. Brent Agin, M. D., a wellness physician who became frustrated with the lack of healthy options, developed TeaZa as a healthy supplement and tobacco alternative that provides oral stimulation, rich flavor, energy, focus and contains no nicotine or tobacco. Former Major League Baseball star and Teaza’s Operation Tobacco Free Ambassador David Wells supports this alternative. “I take a firm approach on tobacco for the high school baseball team I coach. There is no tobacco allowed by any players or coaches. They can dip TeaZa anytime because it’s actually good for them!” added Wells. “Lack of energy is a very common reason for people to see their doctor and patients are willing to do almost anything to increase energy and focus, whether at work or play,” said Agin, who owns and operates Wellness Health Management in Clearwater, Florida. “TeaZa satisfies oral cravings and provides consumers with healthy energy and focus,” he said. Dr. Agin’s team developed a biodegradable pouch with a slow-release, oral-stimulating delivery system. It is zero-calorie and contains vitamins, tea-cut herbs, ground peppers and a natural caffeine source. TeaZa is a nutritional supplement with long-lasting flavor, a little spice and sustainable energy that can keep your mouth happy for hours. “Companies are well aware of society’s insatiable desire for more energy, so they saturated the market with unhealthy products that promise energy, but are often loaded with sugar and dangerous amounts of caffeine. The tobacco industry pushes nicotine through cigarettes, chewing tobacco, and the newest trend - vaporizers, which all have harmful side effects,” he added. Two of the most preventable health risks are tobacco use and overeating (obesity), both of which are heavily tied to cravings and oral satisfaction. “We have an innate desire to make our mouths happy and when we satisfy oral fixations, it stimulates the release of happy hormones and signals the desire to repeat that action,” says Dr. Agin. Chewing tobacco, commonly referred to as dipping (placing a substance between the lip and gum), is a major health issue created by a powerful combination of oral stimulation and nicotine that has proven to be a very addictive. Dipping tobacco is common in many professional sports, influencing more than 500,000 athletes to adopt the practice at early ages. From baseball to snowboarding, kids are migrating to dipping tobacco, initially for the image, but that powerful combination of stimulants and oral stimulation quickly turns into a long-term health concern. Due to the growing problem, there is already a growing movement to ban tobacco products from professional and college arenas and stadiums. “We think Teaza’s ‘Hip Way to Dip’ transforms the way people think about dipping, by providing something both powerful and healthy. Even those who have never used smokeless tobacco will really enjoy this product," Agin added. In coordination with the launch of this new program, TeaZa will provide the first 100 customers that make a single purchase of $100 or more over the next 60 days, a Limited Edition Pro Series TeaZa puck of either former MLB player David Wells, former NFL player Mike Alstott or current Denver Bronco, Bradley Chubb, the number five draft pick in the 2018 NFL draft. Visit Teazaenergy.com for more information. TeaZa® is a tobacco-free, nicotine-free alternative to smokeless tobacco products proven effective by independent research. Doctor-formulated with natural ingredients, TeaZa® pouches are gluten-free, nut-free, vegan and contain zero sugar, zero calories and are power-packed with herbs and vitamins including green tea, ginseng and B-vitamins. 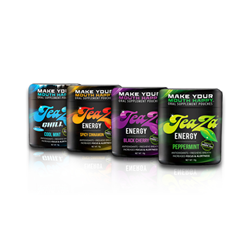 TeaZa® Energy is available in: Peppermint, Spicy Cinnamon, Black Cherry, Bangin' Black Cherry Bomb, Tropical, Coffee and Fire flavors. Caffeine-free TeaZa® Chill with Relora® is available in Cool Mint and Tropical flavors. TeaZa® products do not contain any banned or prohibited substances or ingredients listed as prohibited by the MLB or NCAA. TeaZa® is processed in Clearwater, FL, in a certified Good Manufacturing Process (cGMP) facility, the standard for all supplements not regulated by the FDA. Visit TeaZaEnergy.com. TeaZa Energy Social: Facebook, Twitter @teazaenergy, Instagram, YouTube, Google +. Operation Tobacco Free (OTF) is a prosocial initiative sponsored by TeaZa® Energy that serves to discourage tobacco use and inspire healthy lifestyles through education, community outreach and support of youth sports and health programs. Launched in 2015, OTF has proudly donated tens of thousands of dollars in product donations and sponsorships through its sponsorship program and Ditch the Dip campaign. For more information visit: TeaZaEnergy.com/OperationTobaccoFree.